The topic of WordPress still causes a lot of confusion for many photography professionals, so here are the top 6 questions about WordPress and how you can use it the right way to get the very best from your photography blog. We already know (at least I hope so) that blogging is a great tool for marketing, but there still seems to be some confusion about using WordPress for photographers – not surprising given that WordPress is designed to handle a wide variety of websites and blog. In this article I want to answer some of the questions I got from readers and podcast listeners about the bigger picture of using the WordPress content management system for professional photographers. I often get these kinds of questions from professional photographers, especially about how to put the various content elements within WordPress to the most effective use on your website and blog. In the previous two chapters we talked about the reasoning behind using photography blogs for marketing, and how to write a good blog post that resonates with your audience. Today, I want to take an aerial look at WordPress to see the bigger picture and look at how some of the important pieces that make up WordPress fit into your marketing strategy. As you’ll see, you may not need to use every weapon in the WordPress arsenal just because it’s there, and making the conscious decision to leave some of those things out of your website or blog might even make your life a bit simpler. Although it was originally built to manage blogs, the WordPress software has evolved tremendously over the years and can now help us create just about any kind of website or blog imaginable. Its proper classification is as a content management system (or CMS for short) and WordPress powers a huge number of websites across the Internet. Think WordPress is too technical to set up? Think again—read how to build a photography website with WordPress for more information. For the purpose of answering the questions in today’s discussion, I’ll be referring to WordPress for photographers in the context of the “blog site” model where you have a combined website and blog both working under the same instance of WordPress. The basic idea with a blog site is to seamlessly blend the static pages and evergreen content of your website with your ever-growing library of blog posts, so that the user experience remains the same regardless of where the user is on the site. The colors and branding, general layout, and overall feel of the photography website and blog remain consistent across all of your pages and posts so that moving from one to another doesn’t create any kind of disconnect in the visitor’s mind. #1: Should I Have A Static Home Page? Logically, the place where it all starts, of course, is the home page – although that’s not the place where most of your visitors will first land on the website. Depending on where your visitors come from, they might first arrive on a landing page, a resource page, a specific blog post, or even on one of your category archive pages. Should I have a static home page or just use the default page that shows my latest blog posts as the home page? This is a great question but, first of all, it’s important to understand the purpose of your home page, which is to get visitors where they need to be as quickly as possible, rather than trying to convert them into a customer right away. In one sense, the home page is like the main entrance at the shopping mall. Unless you enjoy wandering aimlessly around the mall, you’ll know what it is you want to buy and will head for a particular store. But, if this is your first visit to this specific mall, you’ll more than likely look for the directory so you know where you’re going, especially if time is important to you. As you can imagine, that type of home page will change every time you publish a new blog post. Depending on how many posts your index shows per page, you’ll see the latest post appear at the top. The post that was at the bottom then gets pushed off the page and on to the top of page two. This type of behavior is bad enough from a user perspective, but it’s even worse news for search engine optimization purposes. At its simplest level, on-site SEO (the kind of SEO you’re in control of because it deals directly with the content of your website) is mostly fuelled by keywords. But, if the content of your home page keeps changing every time you publish a new post, the keywords and distribution of those keywords will also change – and not always in your favor. This constant mutation of your home page can cause its position in the search rankings to be more volatile than it should be, so that’s one good reason for using what WordPress refers to as a static home page instead. The other reason, and probably more important from a marketing perspective, is that a static home page gives users a more consistent experience from one visit to the next. Now, that doesn’t mean the home page content has to be 100% static – just most of it. You can still have a section featuring your most recent posts or specific content you think your audience would be interested in, but you do need some static content for SEO purposes to anchor the intent of the page, as it were. Even for a pure blog with no static website content at all, which is rare in any case, I would still argue that a cleaner home page with some masthead content and clear directions to selected posts, or categories of posts, would be more helpful to most visitors than a simple post index. You can build a static home page by going to your WordPress dashboard and then selecting “Pages -> Add New” to create a new page. Depending on your WordPress theme, you will either add the content you want for your home page directly to the page in the WordPress editor, or you’ll create a blank page and then use a set of widgets as the content, or perhaps a combination of the two. It’s best to consult the documentation for your theme for more specific information on how to do all that for the particular setup you have. Because the standard blog index home page will be replaced with a new static page, you’ll also likely need to create a new blog index page to display your blog posts. Just follow the same process you did for the home page, but this time create a blank page with no content, and then publish it. When you’ve published both your new home page and blog index page, go to “Settings -> Reading” and click the radio button for “A static page” in the section where it says “Front page displays”. You can then select your new home page as the front page and your new blog index page as the posts page. #2: How Much Of My Posts Should My Blog Index Show? While we’re on the subject, let’s talk about the blog index page for a moment. This is where your users can see a list of your latest blog posts, usually with around 10 posts per page, depending on your WordPress settings. How much of each blog post should show up on my index page? This is a big problem that I see with most of the photography blogs I look at, namely that their index pages are showing the complete posts in their entirety, rather than short excerpts. If you have the number of posts to show on the index page set to something like 10, this makes the blog index page very long and slow to load, depending on the length of the blog posts and number of images in those posts, but it also renders the individual post pages themselves redundant. I mean, why would anyone click to see a post from the index page when the whole thing is already right there in front of them? The solution is to set up your blog so that archive pages (such as the main index page) only show excerpts of your posts, each one with a “read more” link to take people to the actual post. Ideally, what you’re aiming for here is a simple and clean-looking index page that makes it easy for your readers to navigate to individual posts. Of course, there are lots of variations on what a blog index page can look like, but it helps to have some kind of featured image for each post, together with the title, and a short description of what the post is about. This is all controlled via the theme for the most part, so you’ll need to check into the documentation for your specific theme to find out what you need to do to set this up properly. In many cases, themes use a standard WordPress feature called the “more tag” in your posts to identify the point at which the index page is supposed to stop displaying content and show the “read more” link. However, at least for most of the photographers I’ve talked to, the “more tag” isn’t something many people are aware of, so you might need to revisit all of your posts and edit them to include it at a convenient break point near the beginning. A better way, in my opinion, is to fill out the excerpt field for your blog posts so that you then have a complete and meaningful snippet of text to show on your index page for each post. Unfortunately, not all WordPress themes will output the excerpt, so you’ll need to check your setup and experiment to see what works best for you. 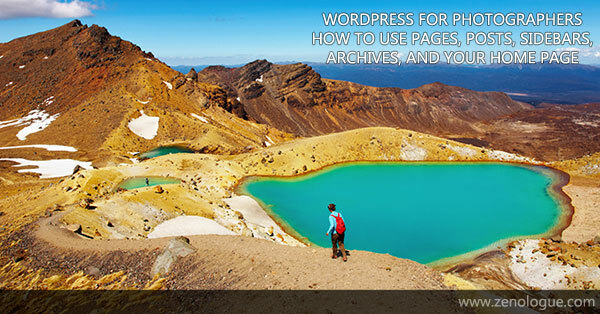 #3: What Are WordPress Pages Exactly? Straight out of the box, as it were, WordPress has two main types of content – posts and pages – and it’s important to know the difference between them, and when to use them appropriately. What are WordPress pages exactly, and why can’t I just use posts instead? Posts, which we’ll get to in a minute, are fairly self-explanatory and make up your actual blog entries. However, I see a lot of examples where professional photographers mistakenly use posts to create content that would really be better off being set up as a page. Pages, unlike posts, don’t have categories or tags associated with them, and they’re not included in the stream of regular blog posts in the blog index for the site. Essentially, pages are standalone pieces of content that need to be linked to from somewhere else in order for people to actually see them. For example, your “about” page should be a page, and not a post, as would your “contact” page or FAQ pages, and people should be able to access those pages from the navigation menu on your blog site. But we also have landing pages, which are usually the destination pages for online ads or the subject of tightly-targeted keywords for search engine optimization purposes. Another type of page you might use is what I call the resource page. Resource pages are created to answer specific questions or address certain topics your audience would find useful. They can be single pages or a group of related pages arranged into some kind of hierarchy, rather like the chapters of a book. There are a couple of awesome things you can do with pages that you can’t do with regular posts. First, pages support the use of templates that alter the layout according to the purpose you set out for the page. You can usually choose from a set of pre-determined page templates, defined by the theme you’re using, each with its own specific layout. For example, a landing page might have most of the normal page elements removed, such as headers, footers, sidebars, and even the navigation menu. It’s therefore important to choose the most appropriate template for the page you’re creating. Second, is the much-overlooked ability to organize pages into a hierarchical order. Let’s say, for example, you have a series of pages about the top local wedding venues you want to feature on your website. To start, you create a page that will serve as the table of contents that has some blurb of its own followed by a table of links pointing to each of the individual pages in the series. Of course, you’ll have to build the link table after you’ve created the individual pages you’ll be linking to, one for each venue. But, for each of those pages, you’ll specify the index page as the parent page, which you can do in the “page attributes” section of the WordPress editor. It probably sounds a lot more complicated trying to describe this than it really is, so the best thing is to try it out for yourself and see how easy it really is to create these small resource hubs within your own website. #4: Is There Anything To Watch For With Blog Posts? I spent the previous episode talking about how to write a good blog post, so I won’t dwell on that part of it here, except to mention a few additional important points. Writing and publishing a blog post seems pretty straightforward, but are there any things we need to watch out for that might not be obvious? In fact, there are several things you need to think about that might not be at all obvious to begin with. First, you probably already know that categories are a great way to organize your posts into different topics, so you definitely should have some categories set up in WordPress appropriate to the work you do and the clients you serve. For sure, none of your posts should ever be set to “uncategorized”. But, even though you can easily attach multiple categories to a single post, it doesn’t make sense to do that, for several reasons. For example, I might see a blog post about a baby portrait session assigned to several categories called “baby portraits”, “newborn photography”, and even “families”. It seems the reasoning for this practice stems from a misunderstanding about search engine optimization and the mistaken idea that doing so will somehow improve the SEO for the keywords used to name the categories. The truth is, those keywords are almost impossible for any professional photographer to rank for, and simply naming categories after them is not going to make even a small dent. A second problem caused by using multiple categories per post is that the same post will appear in multiple category archive pages – those are the pages on your WordPress site that list all the posts from a specific category (more on those in a minute). Unless you have hundreds of blog posts, the category archives are all going to look very similar to both search engines and people. My advice is to create categories that mean something in the context of your business and then assign the ONE most appropriate category to each post. The next thing to consider with your blog posts is whether or not you really need to use tags. Tags are like keywords for your posts (in fact, they used to be placed in the keywords meta tag in the source code), and they can also be used as both organizational archives and for when people are searching on your website directly. However, since the keywords meta tag hasn’t been of any SEO use for many years, the use of tags in posts has dropped off, except for the rare cases where they can actually be useful for on-site search purposes. The only time I would advise using tags would be on image-only posts for a website that acts as, say, a large stock photo library where users might need to search the site for tags in order to find specific photographs. Beyond that, for the portrait, wedding, or commercial photographer, tags are next to useless and I would suggest not using them at all. Also, it makes sense to disable the tags archive pages, which you can do using the WordPress SEO plugin, both to exclude the tag taxonomy from the XML sitemap and also to make sure that the tag archive pages are set to “noindex”, which means Google is discouraged from including those archives in any search results. An issue that affects everyone who wants to get their blog posts shared on social media is dealing with the annoying variation of image standards for each social network. Facebook, for example, expects to see an image with a specific aspect ratio, but that same image won’t perform so well on Pinterest. As with anything that affects your marketing, the golden rule is to take good care of your audience first, and make all other considerations secondary. As long as your target audience are happy and engaged with your blog posts, you can then think about things like SEO (if appropriate) and social sharing. Facebook is probably the most important of the social networks for many people, and it’s obviously helpful to make sure your posts look good when shared. Unfortunately, if Facebook picks the wrong photo from your blog post to use as the poster image, it might not look the way you intended. To make sure you get it right every time, here’s what you can do. Create an image specifically designed as the poster image for your post using the recommended size of 1200 x 627 pixels and save that on your computer as a JPG or PNG file. You can also get by with a half-size image of 600 x 314 pixels, which is the size I use most of the time, and it appears to work just fine. WordPress For Photographers Facebook Tip: The photo above is the Facebook-specific poster image for this blog post. Normally, it would not appear in the content of the page, but you can see it’s different to the main header image at the top of the post. The dimensions of this photo are 600 x 314 pixels. Then, when you write your post in WordPress, you can upload your Facebook-specific photo into the “Facebook Image” field in the “social” tab of the WordPress SEO section in the editor. WordPress For Photographers Tip: This line of code in the header section of the HTML tells Facebook which image to use in the news feed. Pinterest is also a very valuable social network for photographers, and there are plugins available to add a “pin-it” button to all the images on your blog, or even just to specific images. 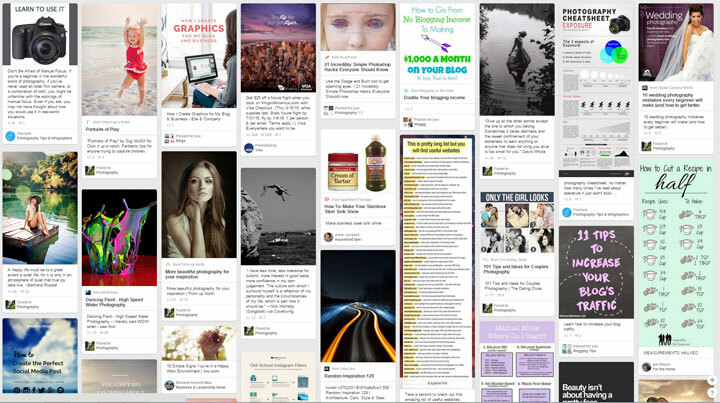 However, the images that seem to do best on Pinterest are tall and thin with an aspect ratio of around 1:3. For example, if you look at the Pinterest news feed, you’ll see that it’s divided into columns and that taller images are given more of the screen real-estate and often see more repins and likes. WordPress For Photographers Tip: This is a screenshot from my Pinterest feed. Notice how the tall thin images seem to stand out more than the smaller horizontal ones. Color and visual impact also make a difference, of course. Because your website likely has images in all kinds of shapes and sizes, I personally think it’s a bit of an overkill to make every image in a blog post pinnable. Instead, I recommend creating an image for your post that’s designed to do well on Pinterest, and then attach a pin-it button to that one image only. You can also write a short call to action near to the photo to encourage readers to pin it to one of their boards for future reference. This might seem like a bit of extra work, but it’s well worth the effort to enhance the value of any social engagement your posts might attract. Would You Like Help With Any Of This? I hope this material is helpful for you, but what can you do if you need help figuring out how to make the most of WordPress for your own photography website and blog, but don’t want to deal with the technical challenges on your own? In that case, I strongly recommend that you join the Prime Focus Lab Marketing Success Group. This is the place to get personalized help from me as well as join in our weekly Q&A meetings and participate in our private Facebook community of like-minded photography professionals. You’ll have access to all of that, in addition to all of my courses and workshops to help with your online marketing. To find out how to become a better marketer for your photography business, click the button below. #5: Should We Have Sidebars or Not? Should I have a sidebar on my blog and, if so, what things should I include or exclude? Sidebars seem to go in and out of fashion more often than long hair and flared jeans, and there’s probably no right or wrong answer to whether or not your blog should have a sidebar. Personally, I prefer to use a single column blog as I found that everything I would put into a sidebar works just as well at the top or bottom of the post, but it’s really up to you and what your readers like. A sidebar naturally takes up some of the available screen width, which therefore reduces the amount of space you have for your actual post. If your theme is already narrow to begin with, that can make the column for your blog post too narrow. But, in many cases, a sidebar creates a more optimum reading width for the main post of around 700px. This can make the process of reading the post a lot easier on the eye. However, that said, a sidebar can also make the page look somewhat cluttered with unwanted distractions and it can become a source of attention leakage if readers click items on the sidebar that might not be part of the path you want them to take. If you do have a sidebar, I recommend being ruthless about the widgets you choose to include on it. The most important one will likely be your email list opt-in form, which should go at the top. Next, you might include a short “about” section with a link to your “about” page. If you have some important resource pages you want people to look at then you can include a list of links to those too. Adding the recent posts widget can be helpful, but I would limit that to the most recent 3 or 5 posts. As far as unwanted widgets go, I would take out everything that serves no concrete marketing purpose. For example, the useless blogroll and meta widgets that come as default with WordPress can be the first to go. Date archives are also not really necessary, as are the recent comments. Social network buttons, such as “like my Facebook page” or “follow me on Twitter”, might seem important, but I’ve found they can lower the engagement time on the blog itself and are better placed near the top of the page, underneath the main header. So, I would take sidebars with a pinch of salt and use them intelligently on your site. I’ve certainly observed no real downside since moving to a single-column layout on the Zenologue website, so I’ll very likely do the same thing with the Photography Marketing Masters podcast website as well. But, at the end of the day, you should do what’s right for your own photography business. This is one of the reasons why the “Prime Focus” program is so helpful, for example, because there is no blanket advice that fits all – what you do depends on your goals and your target audience, as well as where your business happens to be in its life cycle. #6: What Are Archives And Are They Good For SEO? What are archive pages and are they good or bad for SEO? The term “archive page” in WordPress basically means any type of page that used to display an index of your blog posts according to a set of criteria. The main blog index, for example, is an archive page that happens to show all of your published posts, usually in reverse chronological order. There are others, but those are the main ones we need to be concerned about. If you are the only author on your blog, which most professional photographers are, then you should disable the author archive, since it will look exactly the same as your main blog index and possibly confuse Google into thinking you have duplicate content. You can do that via the “other” tab in the “titles & metas” section of the WordPress SEO plugin settings. You can also do the same thing for the date archives. I already talked about the tag archives earlier, but you can safely disregard those as well in the vast majority of cases. That leaves the category archive pages, and your users will most likely see those when they click on the category link in your blog posts or land there from a search engine. I do recommend you leave the category archives enabled, and that you include them in your XML sitemap files for Google. Depending on your WordPress setup and your specific theme, you can also create a special header for your category archive pages, which is shown on the first page of each category archive. These can be useful both as a guide for readers as well as for SEO (although I don’t recommend you go overboard with that – remember to take care of your readers’ needs first). Also, in the “general” section of the “titles & metas” section of the WordPress SEO settings, be sure to check the box that says “Noindex subpages of archives” so that only the first page of each category archive will be shown in search results. Your website home page, and why creating a static home page is better for both your readers and for Google. How much content to show on your blog index page, and how using shorter excerpts might be a better choice for your readers. Some of the benefits of creating pages, rather than posts, for some of your important and evergreen content and how to create hierarchical pages for sets of related pages. Some things to watch out for when writing posts, such as avoiding tags, using a single category, and making your posts more easily shareable on social media. Whether or not to use sidebars, and some ideas on some of the widgets to use and those to avoid. Finally, we looked at the uses of various archive pages and which ones are important and which ones you can safely forget about.